It feels kind of crazy to type this but I've gathered my JUNE wishlist for you, and time is just flying by! With both kids home for the summer, truly my biggest wish is for a little peace and quiet throughout the day, but I'd also take any one of these items as well. 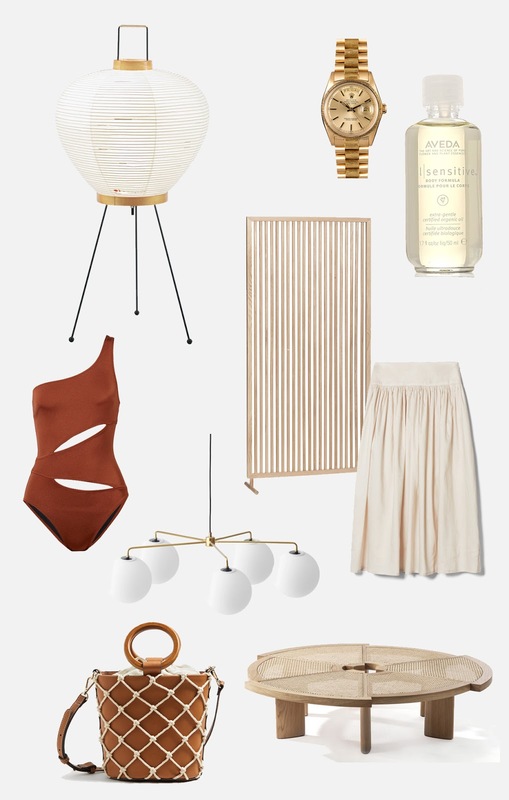 - I'm definitely wishing for another Akari lamp, like this large tabletop version or a floor lamp. - A watch with a little bling in the way of a gold watch. Since I don't wear a whole lot of jewelry or very brightly colored clothes, a little bold metallic would just slide right into my wardrobe without being over-the-top. - Aveda's products smell so amazing, like fresh botanicals and herbs. These are my favorite scents in the whole world, I'd probably prefer patchouli and tea tree to any other man-made fragrance. This oil is on my list for summer, a time when we all chase after that dewy skin look. - I love a good screen or room divider, so I might have gasped a little when I found this oak one from Danish interior brand Hübsch at such a great price. You can use just one to create division in a space or line up several for a larger division and bolder look. - Totême's beautiful Nerola skirt looks like the perfect soft, flowy piece to pair with sandals in the city or at the beach. The minimal style disguises invisible pockets underneath those pleats which make this practical as well. Dresses and skirts must have pockets, in my opinion! - This cutout, single shoulder swimsuit by Solid & Striped is the best looking one piece I have seen all year. The color and shape are so flattering, plus it's on sale right now! - Menu's Tribeca lighting series got a little upgrade with these opaque white light bulbs, this one is the Tribeca Chambers Chandelier. I'm a huge fan of these soft white globes and the contrast of the brass fixture. - A rope and leather bag with circular handles from Mango is a great price and looks so fresh for summer! - Cassina's 529 Rio table by Charlotte Perriand is one I still have a MAJOR crush on after seeing it in this home. The woven cane top and unusual shape with it's wedges of wood is a statement piece and yet simple enough to still be a great stop for keeping books, magazines and tea cups. *This post contains affiliate and ad links, however all selections and words are my own.